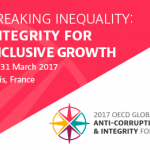 The OECD Global Anti-Corruption & Integrity Forum has become one of the leading public fora on integrity and anti-corruption worldwide, bringing together relevant policy communities as well as the private sector, civil society organisations and academia. The Forum distinguishes itself by being global, multidisciplinary and innovative. The OECD recently published a call for papers, inviting researchers to submit their ideas for the forum.